In seventh pAsuram, parAnkuSa nAyaki‘s friend says “If you take shelter of other dhEvathAs, that will only lead to her destruction; if you want to save her, take shelter of SrIvaishNavas”. chuNangai eRindhu num thOL kulaikkap padum annaimIr! uNangal kedak kazhudhai udhadAttam kaNdu en payan? en payan – what is the benefit? vaNangIrgaL – start worshipping them. Oh mothers! What is the benefit of your praying to the other dhEvathA to cut a goat, the act of which is prohibited and to offer alcohol, considering these acts to be a rare medicine? Your body is having goose bumps and your shoulders are swaying; what is the benefit of watching the donkey’s lips which are chewing the paddy which is being dried while it (paddy) is being wasted (similarly, as she is losing her existence, the engagement with the other dhEvathA is of no benefit)? You start worshipping the bhAgavathas who are best among vaidhikas and who are the devotees of emperumAn, the benefactor who manifested his amazing qualities and activities to her and let her enjoy those. aNangukku aru marundhu enRu – aNangu – divine girl. thamizh meaning “sUrum aNangum dheyvap peN peyar” (divine girl is called sUru and aNangu). Considering it to be a matching and rare medicine for her divine nature. Neither you know her distinguished nature nor you understand the lowly nature of your activity. angu Or Adum kaLLum parAy – Offering forbidden [food] items. parAy – prArthana (prayer). thuNangai eRindhu – thuNangai is a type of dance. eRidhal – offering/performing. Engaging in a particular type of dance. thuNangaik kUththu means a type of dance with clapping of hands – here that may also be highlighted; there is a type of dance where they throw turmeric powder at each other – that may also be highlighted here [thuNangai eRindhu is an accepted variation in the pAsuram, for chuNangai eRindhu] . num thOL … – You who know very well that even an anjali (joined palms) performed towards emperumAn is considered to be great due to the simplicity of SaraNyan (one who gives shelter), have engaged in such lowly activities. AzhwArs think that “thozhudhu … ezhudhum ennum idhu migai” ([devotees] offering obeisances and rising are considered too much [for emperumAn to handle due to his overwhelming attachment for them]). uNangal … – The paddy [which is to be turned into rice] which is the source of sustenance is eaten away by a donkey – what is the benefit of watching the donkey’s mouth/lips chewing the paddy? Similarly, you who have to sustain yourself by having her alive, are letting her become destroyed by engaging in activities with those who are the devotees of other dhEvathAs – what is the benefit in doing that? Not only is there no benefit, it also leads to her destruction. Alternative explanation given by aiyan thirukkurugaip perumAL araiyar – uNangal – suffering. To eliminate her suffering; kazhudhu – ghost. When you offer the goat and alcohol to the ghost [which has entered her body – according to you], and when it consumes those food items, what is the benefit of watching it chew on them? thamizh scholars explain in nigaNdu (dictionary) “kazhudhum pEyum paraNum” (kazhudhu, pEy, paraN are synonyms for ghost). If there is no benefit in these activities, tell us what will bestow us the benefit. vaNangIrgaL – Try to fall at their divine feet. mAyap pirAn … – The SrIvaishNavas who are engaged in the qualities of emperumAn who has amazing qualities and activities. As said in SrI bhagavath gIthA 15.15 “vEdhaiScha sarvair ahamEva vEdhya:” (All of the vEdhams reveal about me only), katavalli upanishath 1.2.5 “sarvE vEdhA yathraikam bhavanthi” (the supreme lord about whom all vEdhams talk in unison) and SrIvishNu purANam 1.14.23 “nathAssmasarvavachasAm prathishtA yathraSAsvathI” (we worship gOvindha who is the essence of all words), those who have understood the essence of vEdham. What is meaning of this adjective “vEdham vallAraiyE” (only those who are expert in vEdham)? 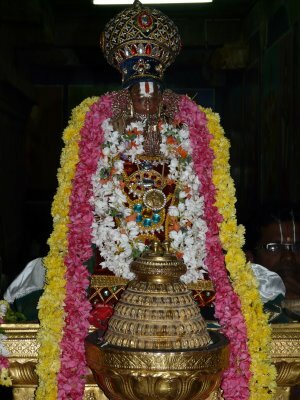 parAnkuSa nAyaki‘s friend set out to highlight the remedy for being treated by the devotees of other dhEvathA; while doing that she says fall at the divine feet of those who feel “Without emperumAn, no dhEvathA has independent capability; He is the only goal”. Instead of falling at the feet of those who think “each dhEvathA has its own duties”, take shelter of those who think that all words are ultimately indicating emperumAn. This entry was posted in thiruvAimozhi, thiruvAimozhi 4th centum on March 7, 2017 by Sarathy Thothathri.